Tattoo artist Amanda Riner has done plenty of tattoos inspired by food. Pizza designs have been especially popular lately, and coffee is a perennial favorite. What’s much more rare, Riner says, is to eat food inspired by tattoos. Riner will get to do just that at an upcoming event at Thompson Seattle. The event, called INKed, will take place on March 7. During the day, Riner and three other tattoo artists—Tascar Wise, Kenny Brown and Derek Noble—will set up a pop-up tattoo shop in one of the hotel’s event spaces. They’ll do recreations of designs by tattoo artist Norman Keith Collins, popularly known as Sailor Jerry, who has been widely recognized for his major influence on modern American tattooing technique and style. Then, in the evening, freshly inked guests—and those who choose to abstain from the pointy portion of the festivities—will join the artists for a multi-course dinner inspired by the life and creative process of a tattoo artist. INKed is the brainchild of Derek Simcik, the executive chef at Thompson’s Scout PNW restaurant. Simcik is covered in tattoos, including a handful of food-themed ones. He has silverware on his fingers, an ice cube on one side of his neck and a chili pepper on the other and a sunny side up egg splayed atop his foot as if dropped accidentally from a pan. Over years of getting new pieces, Simcik has befriended a number of tattoo artists and noticed quite a few similarities between their line of work and his. "There’s the passion and the creativity," he says, "and also the fact you’re constantly bettering your technique." Both chefs and tattoo artists have a certain intimacy with their customers that comes from making art that goes on or in the body. Simcik also sees the tattoo and chef communities as increasingly intertwined. Tattoos in general are more popular than ever—29 percent of Americans now have them, according to a 2016 survey by The Harris Poll—and chefs seemed to be an especially tatted subset of the population. In the kitchen, Simcik uses modern techniques to create food that is visually elaborate and perhaps even befuddling. "I always hope my food starts conversations," he says. He wants guests to be curious about the ingredients and wonder how something was made. With INKed, Simcik hopes to exercise the full range of his imagination and culinary skills. Each course of the dinner will represent a phase in the creative process of an invented tattoo artist. Simcik hopes that anyone on a creative path will be able to relate to the narrative. The first course will be an "edible stained glass" made from pickled herrings and various varieties of beets. It represents the moment of awe when the artist sees a work of art that inspires them to create. The next course gets a bit cheeky with the notion of, ahem, assisted inspiration. Simcik will use potato starch to mold morsels that look like cannabis buds (though will not contain actual cannabis, he was quick to note). Once in the right mindset, the artist puts pen to paper. In this course, Simcik aims to create a striking black and white composition that evokes ink spilling everywhere. He’ll top halibut cheek with squid ink beurre blanc seasoned with citrus ash. A "paper" course of cleverly cooked celery root with squab breast and charred onions will follow. Fittingly, the main course will be the tattoo itself. 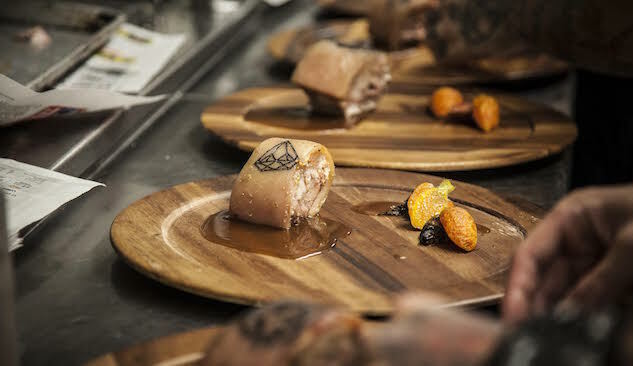 Simcik will carve designs into skin-on pork, which will be served with baby root vegetables. The dessert will made with Sailor Jerry Rum. Simcik hopes that INKed will spark conversations about creativity and the arts among guests. With the current administration’s proposals to slash arts funding looming, he feels this topic is of particular urgency right now. "Art is always the first thing that gets cut and I don’t think people realize what it can do," he says. "Art feeds your mind and helps with creative problem solving." A portion of the event’s proceeds will be donated to Adopt the Arts, a nonprofit organization that funds arts programs in public elementary schools. Events like INKed are a lot of fun for Simcik, but inventing and perfecting so many experimental dishes is a complex project. “We’re looking at composition, color, texture, texture on the mouth and all the elements of flavor,” he says. “It won’t be until I start cooking the first dish that I’ll stop feeling stressed.” He hopes his tattooed feast will hit a host of sensory notes, but he’ll let the tattoo artists bring the pain. You can buy tickets for INKed at Scout PNW’s website.